Bridging therapies are used to offer temporary relief while preventive treatments take full effect. For brief cycles, bridging therapies are sometimes used as short-term preventives. The most common bridging therapy is a corticosteroid, such as Prednisone, given in a taper (large dose, then diminishing doses) over a period of 1-2 weeks. The corticosteroid works to relieve pain by reducing the body’s natural defenses, and thereby reducing any swelling associated with the area of pain. Keep in mind that while taking a corticosteroid your natural immunity defenses are lowered. 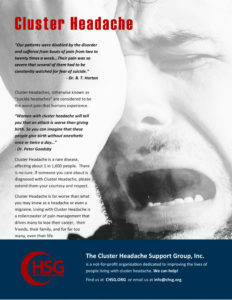 Other bridging therapies may include pain relievers to help get you through the period while you are ramping up on a cluster headache preventative. These may or may not be effective. Another bridging therapy is Greater Occipital Nerve Blockade (GON or GONB). This is administered by your neurologist or by a pain management center. Essentially the approach is to numb the nerve by injecting anesthetics and steroids, thereby blocking the sensation of pain. Depending on your areas of pain, they may inject strictly at the occipital nerve base at the back of the head or they may also inject at nerve trigger points on the side of the head, temple area, face, and brow. The injections are not exactly pleasant, but the procedure can provide immediate relief for ongoing “shadow” pain. This procedure can help to significantly reduce the impact of cluster attacks and can reduce or eliminate shadows entirely. Unfortunately, the effects are not long lasting for most, lasting anywhere from 2-3 days to a month or more, depending on the patient.